Some years ago, after finding out from a cousin who was digging into the family history that my paternal great grandfather was buried in the Melbourne General Cemetery in Carlton, I made enquiries with the keeper of those records, the Greater Metropolitan Cemeteries Trust. They were very helpful and came up with the goods — a location, and they even sent me a map. That’s how I was able to find George Burnham’s grave, which was also the resting place of his wife Matilda. George died in 1901 and Matilda in 1917. George landed in Australia from Shoreditch, London, in September 1863. Matilda (nee Wylie) came out from Dungannon, Northern Ireland, three months earlier. They met and married here, and lived in Emerald Hill (now South Melbourne). The grave location is lot K661 (picture at top left), alongside the cemetery’s 1st Avenue (a happy coincidence as the first house I lived in at Rosebud was in First Avenue). 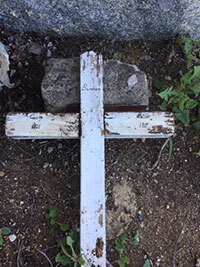 The gravesite was bare dirt when I found it, but not long after I put a simple wooden cross (which I have now replaced as the first one I placed rotted away). I was very glad to have found the burial site of these great grandparents, and thought that otherwise it would have been lost to the wider family. But of course everyone has two parents, and therefore two sets of family connections going back generations, but it’s not all the time that present day families have a lot of information on that background. Well, a development occurred in that regard sometime in the 1990s, with some information being revealed by our mother Myrtle (see some of her story here). Mum mentioned to my sister Janice that her (Myrtle’s) grandfather was Chinese. This fact was completely unknown to all of us, and Mum, then in her 80s, let it out of the bag because as she said (or as I think she said, I can’t check with Jan now) in these modern times it doesn’t really matter, and so what if it did, who cares anyway…. that sort of thing. When this fact sunk in I remember there surfaced little details that made me feel a bit stupid, and maybe others did too. For example not wondering over all those years why our Uncle Les had those almond shaped eyes. That was just Uncle Les, perhaps we all accepted, but now there was another factor that explained it. Anyway, armed with this revelation I managed to track down some details of my maternal great grandfather by going to the Registry of Births Deaths and Marriages. But having to work backwards, if you know what I mean, what I ended up being able to find was the birth entry for Mum’s dad, who was named David Young, born in the late 1870s. This birth record was a page out of a ledger, with details filled in. Some of the particulars required were: Mother’s name, Anna or Annie Henderson or Anderson (it was hand written and not the greatest penmanship). Father’s name, Charles Ah Young (huh?). Father’s country of origin, China. Here then was documentary proof of Mum’s family secret. I took this information to the curator of Melbourne’s Chinese Museum, who told me that Ah Young wouldn’t have been the actual surname, but rather a sort of play on his real name, while being close to the original. And “Charles” was also probably dubious, as in those racist days all the whities tended to call every Chinese man “Charlie”, so he probably just took that on. The museum curator also informed me that the mother was most likely very poor or a prostitute, but that in reality having a Chinese husband ended up being a good choice as they usually did not drink and did not beat their wives. The offspring introduced in the document above (Mum’s dad, David) had five kids — these, not in order of birth, were our mum Myrtle, her sister Bess and three brothers, Albert, Les and Dave. Myrtle was the only one to have kids. Uncle Dave was the last one to pass away, and some time after, maybe a decade later, a box of old Young family photographs and other papers was being passed around among us next generation. This was sometime after 2015 I think. From these, Janice uncovered an old receipt for the hire of a “carriage and pair” from an undertaker, issued to a “Mrs Young” and dated February 26, 1892. The carriage was hired to take a coffin from Albert Park to the Carlton cemetery. Our first thought was that perhaps this is for the burial of Charles mentioned above, and now that I had a name and a date I contacted the Cemeteries Trust again to enquire if they could possibly give me a grave location — and yes they could. Again the information was thorough, and included the location and the names and dates of all who were interred there. 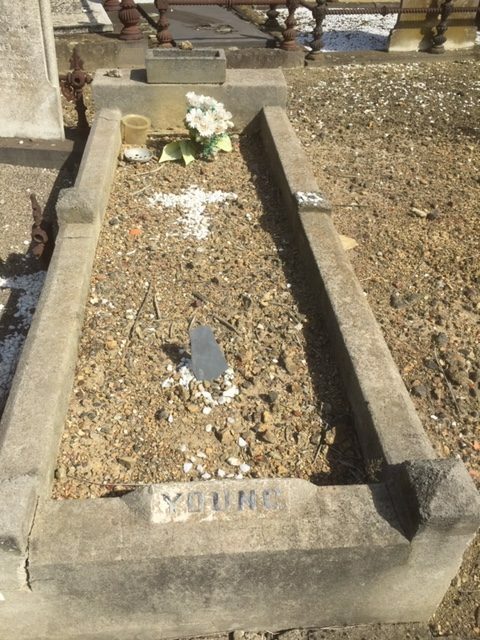 It ended up that the 1892 burial was for an Albert Young, who must have been an infant as the age given was zero. Next to pass away was “Hannah” in 1931, aged 72. This must be the Anna (or Annie) on the badly scrawled birth record mentioned above for Mum’s father David. So the record taker back in the 1870s got that wrong too (probably a bit of “attitude” at work, and now we also know that Hannah must have been very young when she married). Next was the man himself, Charles. He died in 1936, aged 90. The last one in was named Ethel, in 1959 aged 71. I’m assuming she was another one of Charles and Hannah’s kids. And another fact revealed, and it’s nice to know (as Mum had a brother named Albert), that her dad named one of his sons after the infant who was buried in 1892 — the little brother he never got to know. The grave itself (pictured at the top right of this page) , like George Burnham’s, is also without a headstone, but at least has a low concrete border, with the name Young set in the foot. 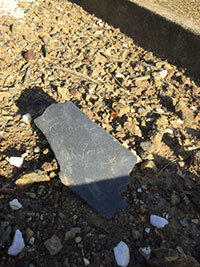 I found a piece of broken roof slate and scratched Charles Ah Young on it to put on the grave. I took Jan to show her what I found. The location is also on 1st Avenue, site U127 (recorded as CE-U-807-127). Anyway, here’s the thing. My paternal great grandfather and my maternal great grandfather are buried literally within a stone’s throw of each other. Well, maybe a stone thrown with a run-up, and by someone with longer arms than me — but certainly within shouting distance. So how’s that. 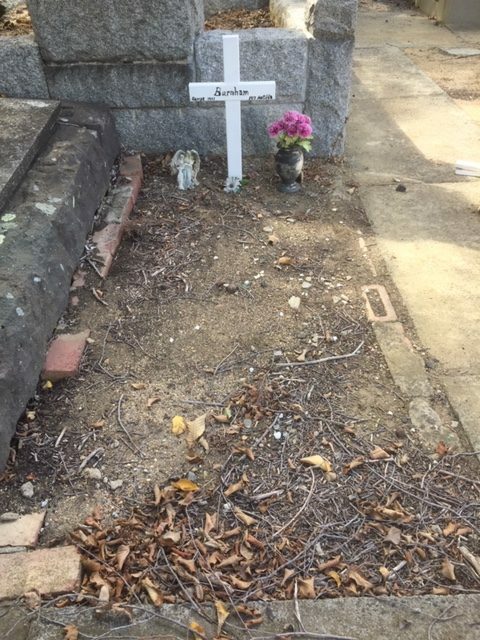 Two gentlemen, coming to this country at around the same time (late 1860s) but from other sides of the earth (and cultural worlds) have a common descendant and end up being buried close by, with that same descendant able to identify their resting places. I wish I could introduce them.